When you think back at this game, it was an incredible match. Ten-man Charlton fought back from being a man and a goal behind at half-time and won a single point that could oh-so-nearly have been all three; it was a Herculean effort. As predicted, the weather in Somerset was pretty foul; a howling wind that blew straight down the ground and heavy rain for most of the match made conditions appalling. Very early on I was concerned that the game may not finish and, but for the rain relenting at some times the referee may have had a hard call to make. Ultimately, I think the result depended once more on the fact that Charlton handled the wind much better than the opposition, and as with last week’s thumping of MK Dons, a second half performance with the gale at their backs was much better than the opponents efforts on the first 45 minutes. Playing into the wind in the first half, Charlton merely tried to slow things down, keep the ball as low as possible, and soak up the pressure coming into their faces. It was all going fine, but for a few kicks from Carl Ikeme that failed to reach anywhere near the half-way line. Then, after half an hour, the linesman working in front of the seated Charlton fans made his mark. Mason looked several yards offside out on the right wing, just in front of the lino, and chased onto the ball over the top with the inept official chasing him with flag down. 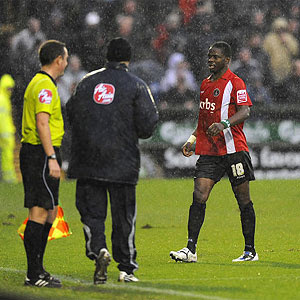 Sam Sodje, coming across to cover was beaten to the ball and not helped by the conditions which meant he clattered into the Yeovil forward; the referee was left with little option but to send him off (top pic), despite his protestations that it was his first offence. Even then, the linesman failed to signal where the foul actually happened and the resulting free kick was taken a good ten yards infield from where the clash occurred - much to Nicky Bailey's annoyance - leading to a much easier shooting chance. An hour to play and down to ten players, it really looked bleak for the Addicks, and a few minutes pressure came upon them courtesy of the West Country side rather than the weather while Phil Parkinson re-organised. On came Miguel Llera to fill Sodje’s gap, with willing runner Dave Mooney sacrificed for the extra defender. It did seem that Charlton might make it to half-time level, but just before the break, with the rain starting to lash down again, the linesman again gave any benefit to Yeovil when a ball over the top of Christian Dailly saw Obika run through to slot past Ikeme. It was a very tight call, and after the obvious offside missed when Sodje was sent off, the linesman got plenty of booing as the half ended. In such games, you tend to see one side capitulate after a negative impact like that, or bounce back and battle; with Parky making a very positive move in taking off Therry Racon (who was somewhat drowned out by conditions in the first half) and replacing him with the sent off man’s younger brother, Akpo Sodje, it was hard to tell how Charlton would fare. With the elements now helping the Addicks, and an excellent start made to the half, the visiting fans were once more berating the linesman when he made his third contentious decision of the day, and another in favour of the home team. A free-kick on the edge of the box saw Llera thump a shot toward goal; the shot was parried and fell to Akpo Sodje who gleefully smashed it high into the net only for the lino to stand with his flag raised for offside. Maybe the referee had reminded him of the rule at half-time, or maybe he just got it wrong again, as it didn’t look like Sodje the younger was offside when the original shot was hit. Charlton kept the pressure on despite this, and corner after corner were won. Grant Basey was swinging them in from the penalty spot, only to see them go out of play on the far side, courtesy of that wind. He did learn from each kick though. Soon, Charlton drew level, and what a goal it was. The young Sodje was again involved, picking up the ball about thirty yards out, and with no challenge made, he thumped a glorious strike past McCarthy and high into the net. The fans went mad and it did make up for his brother being sent to the stands. It was all Charlton now, with Ikeme touching the ball just once in the first 30 minutes of the second half. A pass back to the home ‘keeper was heaved forwards, reaching well outside the penalty area, only to turn on the wind and go for a corner kick without bouncing. Bailey tried his hand at a corner kick and hit it low to the near post only for it to be sliced just wide by a defender, with Bailey thinking it was in the net. Sodje burst through again and was denied when his shot was deflected onto the post by the ‘keeper, then Basey took another corner kick, and having got his range, saw that swing on the wind to be tipped onto the bar by a desperate McCarthy. Bailey then took another free kick (to Llera’s annoyance) but hit the defensive wall, while Lloyd Sam and Deon Burton had efforts charged down. The goal just wouldn’t come, and as the game entered the last five minutes, the heavens opened again, and with standing water on the pitch, I think Charlton ran out of steam a bit. Yeovil had a couple of late attacks, but the game finished even. The drenched players came over to show support to the even more drenched fans who came along, and then disappeared into dry changing rooms. It was a great performance from the Addicks players in appalling weather and pitch conditions, and but for the sending off, would have ended with all three points won I am sure. The effort may take its toll on some players with another game on Tuesday, but at least Mooney and Racon will be fresh, and it was good for Llera to get an hour’s practice before his starting roll to replace the suspended Sodje. The experiment of playing Kelly Youga and Basey as full backs seemed to work OK, with neither unduly troubled defensively, while both pushed forwards whenever they could. Jose Semedo and Sam both had impressive second halves; with the onus being on work both saw plenty of ball and covered much ground. And hold their manhoods cheap whiles any speaks that were drenched with us upon Phil Parkinson's day.